I attended a Spring Stamposium this past Saturday, and used the card below as my swap card. The day was filled with stamping and stamping business tips and time with stamping friends. It doesn't get much better than that! Anyway, here are the card details. The stamp sets used are the new Awash with Flowers set that will be in the new catalog when it comes out in July (but it's available as a sneak peek during the month of April), and Heard From the Heart. I purchased the Awash with Flowers set in clear-mount, and it definitely helps to line-up these 2-Step stamp sets using the clear-mounts over using wood-mount and a Stamp-a-ma-jig. The colors used are Pretty In Pink, Old Olive, Confetti White, and Basic Black. The message image was stamped onto a strip of Vellum card stock and attached on both sides using Pretty In Pink brads. 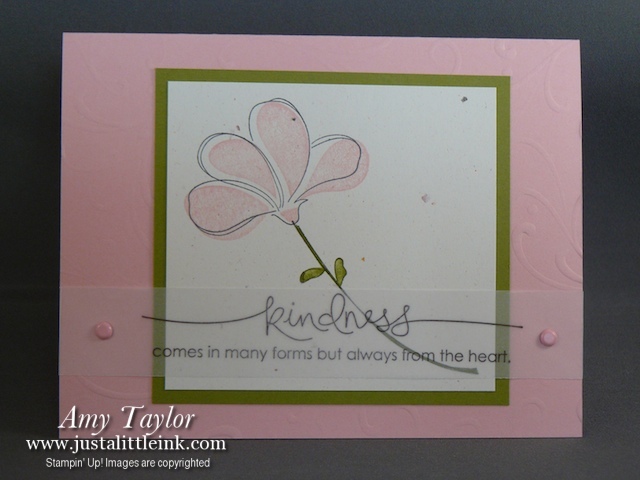 The Pretty In Pink card base was given some texture using the Perfect Details texture plate and the Sizzix Big-Shot.